DALLAS — Omnitracs has embarked on a mission to reduce wasted time and inefficiency in trucking by harnessing the latest advances in cloud computing and software design. Although the transportation industry tends to focus on miles traveled, the more important metric is time, said Omnitracs CEO Ray Greer, who cited driver detention, hours-of-service limits, time spent searching for truck parking and delays caused by traffic congestion and weather. 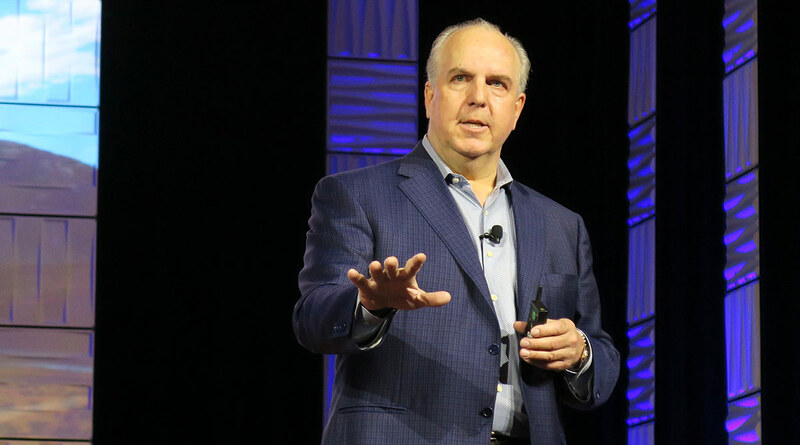 Omnitracs aims to lessen that constraint by improving dock scheduling and load planning, automating driver workflows at shippers’ and receivers’ facilities and using artificial intelligence to make better dispatching and routing decisions, he said. To make that possible, Omnitracs is in the midst of moving to a redesigned software platform that takes fuller advantage of cloud computing, in which services are provided over the internet. This “cloud-native” architecture strategy will accelerate the development of new applications and enable further innovation to solve the industry’s challenges, Greer said. Omnitracs has partnered with software firm Red Hat to build that platform and migrate its applications onto the new architecture. At the same time, Omnitracs is expanding the rollout of its unified software platform, Omnitracs One, which combines the capabilities of its various product lines, including XRS and Roadnet. About 40 pilot customers are running that software today, but Omnitracs is planning a broader launch in September. Omnitracs also has introduced new hardware options. The Active Mobile Gateway with Communications, or AMG-C, enables drivers to use Android-based smartphones or tablets to access Omnitracs applications. This “bring-your-own-device” system, available in September, will offer connectivity via Wi-Fi, 4G LTE, Bluetooth and mobile hotspot. Omnitracs also introduced an updated version of its flagship in-cab terminal, the Intelligent Vehicle Gateway, or IVG. The company plans to offer a software update that will convert the IVG to the Android operating system in the first quarter of 2020. With these hardware options, fleets will be able to deploy onboard technology through hardwired in-cab displays, mobile devices or a combination of both. Greer also reflected on the industry’s adoption of federally mandated electronic logging devices to record drivers’ hours-of-service data. Even though the ELD mandate has been in effect for more than a year, much work remains to bring the industry into full compliance with the regulation. Many fleets still are using older e-log systems categorized as automatic onboard recording devices, or AOBRDs, which were grandfathered under the regulation for two additional years. That AOBRD exemption is set to expire Dec. 16, but only 10.7% of Omnitracs customers that are required to convert their devices to ELDs have done so at this point, said Greer, who urged fleets to begin planning for this transition. The tighter focus on HOS compliance under the ELD rule also has shined a spotlight on the need to reduce driver delays at warehouses, ports, fuel stops and weigh stations. Detention time robs U.S. truckers of an estimated $1.1 billion to $1.3 billion annually, Greer said. “It’s my belief, because of our scale and customer base, that we have the wait-time data on every pickup and delivery location in America,” he said. That type of information could help fleets better understand revenue per hour for a given load, as opposed to a simple per-mile calculation, said Mic Yariv, Omnitracs’ vice president and general manager of strategic initiatives. She said that knowledge could prove valuable in an environment where fleets are scrambling to make the most of drivers’ limited time, a situation she likened to a football team preserving the clock in a two-minute drill. Fleets could even consider pricing their business based on the time it takes to complete a load rather than its distance.